Iranian boats harassed and provoked three American Navy ships in the strategic Strait of Hormuz, threatening to explode the vessels, U.S. officials said Monday, calling it the most serious such incident in years. U.S. forces were taking steps toward firing on the Iranians to defend themselves, said the U.S. naval commander in the region. But the boats - believed to be from the Iranian Revolutionary Guard's navy - turned and moved away, officials said. "We take this deadly seriously," Vice Adm. Kevin Cosgriff told a Pentagon news conference via video from Bahrain. 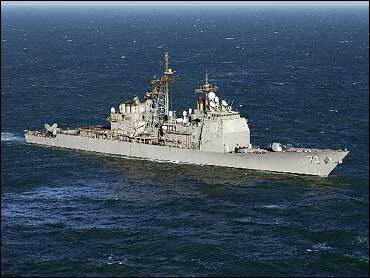 "It's important to remember we have been attacked by small high-speed boats in the region," said Cosgriff, recalling the USS Cole in which 17 U.S. sailors were killed when an explosives-laden boat rammed the destroyer as it refueled in 2000 in Yemen's port of Aden. Iran's Foreign Ministry said Monday that the confrontation early Sunday was "something normal" and was resolved, suggesting the Iranian boats had not recognized the U.S. vessels. The Bush administration said that Iranians should "refrain from such provocative actions that could lead to a dangerous incident in the future." High-seas hostilities have been building for months, with heavily armed speed boats carrying Iran's Revolutionary Guard darting near U.S. ships patrolling the dangerous waters of the Persian Gulf, CBS News correspondent Bob Orr reports. This is at least the third time in six months that Iranian boats have harassed U.S. ships in international waters, Orr reports. And just last March, 15 British sailors were captured in the Persian Gulf and held for two weeks by the Revolutionary Guard. The incident raised new tensions between Washington and Tehran as President Bush prepared for his first major trip to the Middle East. According to CBS News White House correspondent Mark Knoller, White House spokesperson Tony Fratto said the Bush administration urges the Iranians "to abstain from such provocative acts that could lead to a dangerous incident in the future." Cosgriff said the incident occurred at about 8 a.m. local time Sunday. CBS News has learned from Pentagon spokesman Bryan Whitman that the three ships - the guided missile cruiser USS Port Royal, the guided-missile destroyer USS Hopper and the guided missile frigate USS Ingraham - were transiting the Strait of Hormuz into the Persian Gulf when they were approached by 5 Iranian fast boats, some of which were assessed to be visibly armed. The five small boats began charging the U.S. ships, dropping box-like objects in the water in front of one of the ships and forcing the U.S. ships to take evasive maneuvers, said Cosgriff, commander of the 5th Fleet and of naval forces in the U.S. Central Command region. "At one point during this encounter ... the ships received a radio call that was threatening in nature, to the effect that they were closing (in on) our ships and that the ships would explode - the U.S. ships would explode," Cosgriff said. While meeting the leaders of Israel, Egypt, Saudi Arabia and other regional nations Jan. 9-16, Bush is expected to try to bolster the troubled peace process between Israel and the Palestinians but is also likely to seek backing for U.S. concerns about Iran. Iran is under two sets of U.N. Security Council sanctions for its refusal to freeze uranium enrichment, a potential pathway to nuclear arms, and Washington is pushing for additional U.N. penalties. But a recent U.S. intelligence assessment that it probably shut down a clandestine weapons program three years ago have led to increased resistance to such a move from permanent Security Council members Russia and China, which have strategic and trade ties with Tehran. At the State Department Monday, spokesman Sean McCormack said he was not aware of any plans to lodge a formal protest. "Without specific reference to this incident in the Strait of Hormuz, the United States will confront Iranian behavior where it seeks to do harm either to us or to our friends and allies in the region," McCormack told reporters. "There is wide support for that within the region and certainly that's not going to change." Pentagon spokesman Bryan Whitman said the Defense Department will work with State and National Security Council officials to determine "the appropriate way to address this with the Iranian government." But Iranian Foreign Ministry spokesman Mohammed Ali Hosseini played down the incident, suggesting it was an issue of misidentification. He did not comment on the U.S. claims of the Iranian boats' actions. The incident was "similar to past ones" that were resolved "once the two sides recognized each other," he said. An Iranian Revolutionary Guard official also described the incident as nothing unusual. "No unusual confrontation has taken place between the Guard's patrol vessels and U.S. ships," state-run television quoted the official as saying. The official was speaking on customary condition of anonymity. The Guard official said the Guard's vessels were conducting normal patrols in the Strait of Hormuz when they saw three U.S. ships enter the waters of the region. "The Guard's navy vessels, as usual, asked the ships to identify themselves and they did so and continued their path," the TV quoted the official as saying. Whitman said the U.S. vessels were in international waters, making a normal transit into the Gulf. He said the Iranian boats were operating at "distances and speeds that showed reckless and dangerous intent - reckless, dangerous and potentially hostile intent." Historical tensions between the two nations have increased in recent years over Washington's charge that Tehran has been developing nuclear weapons and supplying and training Iraqi insurgents using roadside bombs - the No. 1 killer of U.S. troops in Iraq. As one of the world's most vital chokepoints for oil shipping, the 30-mile-wide Hormuz strait has been the subject of previous armed confrontations between the United States and Iran, most notably during the eight-year Iraq-Iran war of the 1980s.